The story of Luisa and Andrew Vollaro is the classic success story of many of the sturdy immigrants who arrived in the United States before the turn of the century. They came with little more than a spirit of freedom and adventure. Like seeds that find their way into fertile soil, they sprouted, grew, and blossomed. Things were not easy then but six of the nine children born to them survived and grew into strong, productive young adults. Charles, Joseph, Nina, John, Elizabeth, Andy, and their parents formed a strong family unit. Each relied on the family for growth while they contributed to its support. In 1927, they decided to see some of the country that had been so good to them. Traveling in a large touring car, they began a trip that took them through nine states from Pennsylvania to Maine. The natural beauty and majesty of the Adirondack mountains was especially alluring and following the instincts that had lead them in the past, they decided to buy land in the Adirondacks. In the years between 1929 and 1932, two parcels of land were purchased on Schroon Lake. Thus began the legend of Luisanda. During the great depression when steady employment was scarce, some of the family began clearing the land on the west shore of the lake by hand. Five small cabins were built, and these were rented to hunters and travelers that came to the area. As time passed, improvements were made. Running water was installed and the out house was fitted with flush toilets. The establishment was aptly named Luisanda which was derived by joining the names of Luisa and Andrew together. It was Andrew who continued the business after the death of Louise and the return of his children to steady work. He would often visit with his customers in the evening, offering his advice to honeymooners and humorous stories to anyone that would listen. With the support of his children and grandchildren, he continued the business until he was almost 80 years old. 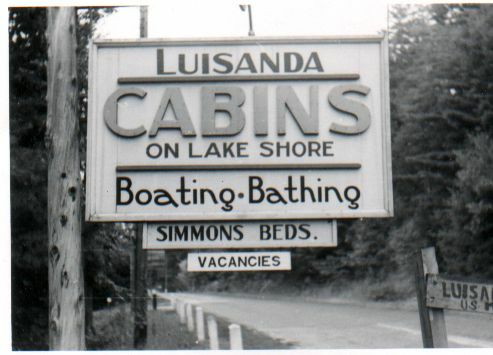 In the years following his death, Luisanda became a vacation haven for the family. Its mention brought a sparkle to every youngster's eye, and a host of fond memories to the adults. Commercialization however took its toll on the peaceful surroundings, and highway improvements cut away about a third of the land. The fate of Luisanda was now in the hands of the four surviving children of Andrew and Luisa. In a bold and creative move, they managed to rescue the spirit of Luisanda and give it new life. In 1960, Joseph, John, Elizabeth, and Andy sold the west shore property and used the proceeds to rebuild Luisanda on the east shore. In this year of 1982, we celebrate the 50 years since the purchase of this land with a salute to those whose generosity and foresight have kept the spirit of Luisanda alive. Its a spirit that has always drawn its strength from a commitment to family unity. With God's blessing, may that spirit continue.